The Fun Continues !! - Pool Side Party + Beach ~ Smithankyou - Lifestyle and Travel Photo Blog. Just when you thought crazy old school fun was a special guest.. it was here to stay !! Yes.. we had more fun @ keong's.. after the National Steam boat and Dumdum's beach party we had a pool side BBQ party this time round !! Better still we had Kath and Merv joining in the fun.. loads crap of laughter, good food by liping AGAIN and booze from ah keong !! And QOTD goes to Liping : " I like to cook alone !! " And we had some fun with the games, from board game of ah keong to some random game Ma and I tried with Karen and JunJun's " Hm Chi Chi Hm Chi, TooKee TooKee + Dong Kat Dong Kat" and yes.. when there is games.. there is forfeit ! !we had some pudding looking drinks as forfeit.. yuck ! Pics are with Liping, so oh well.. we'll have to wait until next time !! 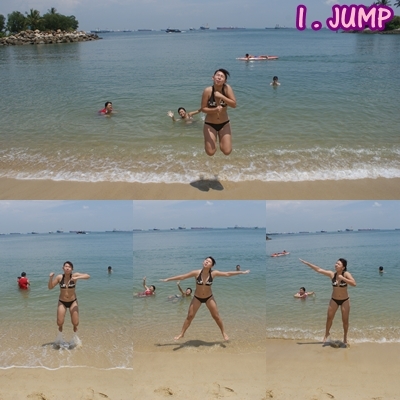 muahaha..
Let's take a look at some of the pics which i "Owe" u guys from the previous sentosa trip..